Would a complete 912e engine have any value? For some, myself included, the challenge of making a vintage car fast is actually a big part of the fun in ownening one of these machines - just look at the good time that dude is currently having who is tubocharging his 2.7 (thread in 930 forum). I’m swapping out the engine, not because I want to compete with a new Nissan GTR or something, but to make the car feel like a sports car. The type4 is wholly inappropriate for a sports car. There’s no power above 3500 rpm, just noise. It’s a very doggy tractor engine. It’s also insanely expensive to build, it actually costs more to build a “performance” type 4 engine than it costs to build a stock 2.7 or 3.0 Porsche engine. I’m a sports car guy, I like light agile cars for tearing through the twisty back woods roads and the occasional track day. The type 4 just would cut it. Do you have a Bursch muffler? Mine used to and going back to an OE muffler made a considerable difference above 4000 rpm. Enough that I sold the 2.7 6er I had that was going to be swapped. It’s got the OE muffler. I did a lot of analysis of the T4 engine with Autodesk Inventor to analyze heat flow and mechanical loading. Basically, I came to the conclusion that I’d have to re-engineer the entire engine, Nikasil cylinders, dry sump oil cooling to reliably deal with the power levels I want. Cost wise, would have cost much more than a 3.0 swap. Even then, I’d be left with an obscure fragile engine. That’s why I’m going Subie swap. It’s lighter than the T4 engine, and much much much less work to build a reliable 200 hp. Cooling wise, I won’t need a trunk mounted radiator like the V8 swaps, a single center radiator with an RSR duct will work fine to dissipate enough heat. Subie is lighter than a T4, puts out around stock carrera 3.2 level power, simple and reliable, and easy to repair. Price wise, T4 build would have been most expensive, 2.7 swap cheaper, and Subie swap the cheapest option to get to around 200 hp reliably. Yeah, there are of course turbo or other high hp T4, but these engines don’t last 10,000 miles. Not sure where you learned sports cars have to be fast ? the 1/4 mile and in the corners. Is a Honda Civic now a sports car ? WTF is happening, Frikin Rice Burners ! This website is pretty cool. Check it out. What other definition of sports car or sport bike is there, other than "goes fast"; "looks fast but isn't", "looks slow and is, but ain't slow motoring grand"? The Honda comparison doesn't work for me as when I look at a Civic, I do not see a sports car in its exterior design (more like a grocery getter or utility transport device) - a high performing engine in a nanny mobile makes about as much sense to me as a weak performing engine in a sports car (I find both concepts pretty silly). And the amazing thing about those numbers is that they were achieved utilizing a terribly performing turbocharger, underperforming muffler and intercooler, non-optimal air-to-fuel ratio (non-adjustable in original trim), etc., etc - fix some of that and the car really scoots then. That is a concept that many of the, "keep it stock - vintage car mods are a waste", drum beaters do not understand. 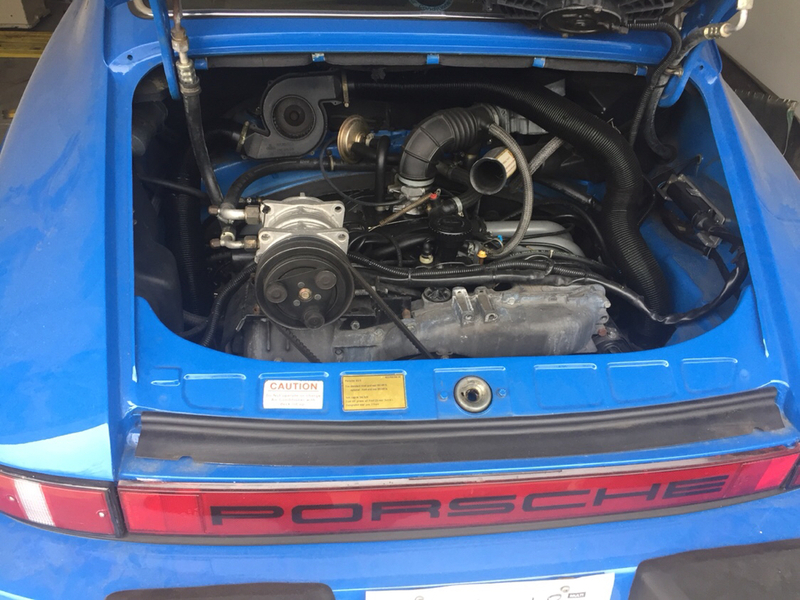 Last edited by Rawknees'Turbo; 01-31-2019 at 05:58 PM..
You'll get no argument from most of us that the 912E engine ain't worth jack; a Subaru engine in a Porsche seems a little weird to me, but reasonable folks can disagree. Either way (at the risk of telling you what you already know), you'd be smart to squirrel the Series 4 engine away for the completist who one day wants desperately to buy your car. In defense of the Type IV engine - I believe it works well and is fun in a 914. I like the sound of one with a real exhaust. It goes back to the philosophical question: Does it have to be fast to be fun? Does it have to be a 911 to be fun? The answer is obviously no, as we have talked about. Bugs, 356s, 912s - are all fun to drive. And I believe a nicely sorted 914 is very fun to drive with a 2.0 Type IV. Not that weird. It's a 4 cylinder water boxer. I'm planning on putting one in a 914 at some point. I suppose that "fun" can be applied to every vehicle on the road, dependent on one's perspective; even my 1990 E350 box truck, with a 7.3L DMFI diesel is fun to drive in certain situations (not talking about "free candy" trolling either! ). A 912e is just a vw bus shaped like a porsche. I would still be interested in your 912E engine when you decide to part with it. Do you suppose a complete, running 912e engine would have any real, tangible value to anyone? By real value, someone who’d actually pay money for it. I honestly have no idea if this engine has any value to anyone. This engine was semi-recently rebuilt with receipts and runs fine. It just doesn’t have enough power for my taste, that’s why it’s going bye bye. I know there’s some clown on eBay selling one for $8500, and he’s been re-listing it for years. I guess he must not place much value on his time or shop space. It’ll certainly be some time before I get around to pulling it, like 6 months to a year. So I’m not really sure what to do with it when I finally get it pulled. I’d rather not have it taking up space in my minuscule shop. I would give you 2-2500 for it. Wow, this is most cracks, stabs and pokes I've read in a while about the type 4 and the 912E! No need for me to give my opinion, but nice to read everyone else's. It does have value to folks like myself. Let us know when you are ready to part with it. Can definitely give it a good home. The prices go up and down so that too would vary depending on when you pull to sell. I'm pretty sure you'll be able to offset the Subbie upgrade by quite a bit if the prices of donor/swap motors are as low as I had heard. Might make a nice powerplant for a 23 window that is accustomed to 40hp VW power. Someone somewhere will buy it at the right price.